Ahhh, the first snowfall of the season came this morning and its also the first time it has snowed since we moved into our new home in July. It’s week two of the Sizzix Triple Play Blog Hop bringing us to the twisty turvy design by talented pop-up artist Karen Burniston. Starting with the Twist Cube die by Sizzix I decided to make a little a little Christmas ornament and gift. I was inspired by Lenka’s popular Christmas song where she sings “take my heart this Christmas, I’ll wrap it in a ribbon and a bow.” How does one actually wrap up a heart to give for Christmas, you ask? Well, this is what I came up with. I started with painting each side with some super creamy acrylic Folk Art paint from Plaid. They also have some awesome “Extreme Glitter” paint that I used to add the glitter, applying it as a paint, keeping my studio nice and glitter-mess free. I decided to cut little heart shapes out of the sides of the box and backed each one with a soft warm sheet of holiday colored felt. From there I stitched away adding my Something to Cherish embroidery flair to the project. Adding the bells to the top of the box and to ribbon and bow was the final touch to echo the song lyrics, “all my bells are ringing for you.” Now it is a little something special to put under the tree for my Love. Putting the box together was the fun part, I am grateful for the wonderful instructions from Karen and Sizzix. Ready to start your Christmas crafting, here is Lenka’s Christmas song to get you in the mood. Wonderful little ornament! Love the hearts. I love what you did and your use of mediums here. Nice gift idea. 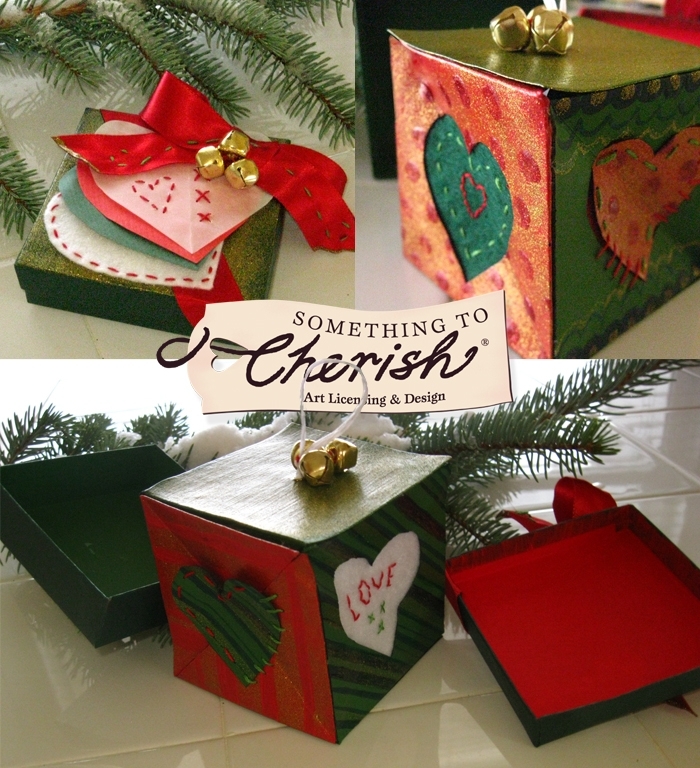 I love the stitching and felt hearts and the whole idea of the heart in a box. Mahalo. adorable…love how you had the moving pictures to show the projects…very cool! so sweet, just like you, Cherish! So cute! The stitches, the texture and the colors…. oh my! Thanks for sharing! Adorable and love the felt hearts!!! So precious. Love the hearts!! Amazing. Truly, inspiringly, AMAZING! I love the way you cut out those shapes and backed them all fuzzy and Cherish-y. And the presentation of your project with the rotating pictures? I love it! I want to do that! The song is very catchy, too. Everything about this is wonderful and I’m honored that you used my die.